Flooring and backsplash ideas to inspire your home improvement project. With over 25 years of industry experience, Stemmley’s Flooring & Backsplashes is your first and only stop for your flooring and tile home renovation projects. We continue to educate ourselves on new flooring and tile products including new innovative installation techniques. A current trend right now is replacing old stair treads and risers to give an area of the house a refreshed look and feel. Another popular installation we’ve done is installing a special heating grid under tile floors for more efficient heating during colder temperatures…and no more stepping out of a warm shower onto a freezing tile floor! Stemmley’s Flooring & Backsplashes offers a level of quality and service that is a step above our competitors. Our decades of experience enables us to provide homeowners with accurate up-front pricing and work to establish expectations from the start. We are homeowners ourselves. Therefore, we realize that you want to know how much disruption any construction project will be in your life. Stemmley’s Flooring & Backsplashes can provide you with accurate start-to-finish timelines for your project. And, probably the work ethic we are most respected for – we clean-up our construction messes before we leave! Here’s a quick list of services we can offer. Call us at (636) 390-0314 or email us today for a free estimate on your home improvement project! 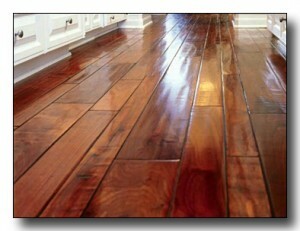 Shiny hand scraped hardwood floors with a lush cherry stain. Installing hardwood & laminate floors is our specialty. We work with a wide variety of wood types (oak, hickory, maple, bamboo & Brazilian cherry to name a few), flooring brands and flooring sizes. We install every size of hardwood including 2-1/4″ strip, 3-1/4″ plank and handscraped (pictured). These days, manufacturers make boards as wide as 9-10″ wide! This flexibility allows homeowners to pick a flooring that fits their budget and love. Many other companies are locked into certain brands or makers – with Stemmley’s Flooring & Backsplashes, the possibilities are endless. A room can have a complete make-over with just a change of the flooring. Our flooring expert will work with the homeowner on designing a floor that will transform the room into a space that is inviting and functional. Hardwood and laminate flooring can be installed in a straight flooring pattern. Or we can show you some of the more elaborate flooring designs with borders and unique angling that will really draw the eye to any focal point in the room. 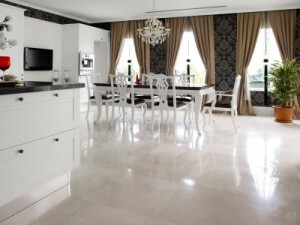 Elegant kitchen and dining room with gorgeous white marble floors. Marble is an exquisite material that symbolizes refinement, tradition and beauty. Due to marble being a natural material, there can be variations in its coloring and veining patterns. For any novice installer, marble can be very unforgiving and difficult to work with. Marble is expensive and waste is not an option when trying to keep a project within budget. Stemmley’s Flooring & Backsplashes has years of experience installing and working with marble. We are familiar with its natural properties and its unique characteristics. Our experts are conscientious in the installation process when working with a natural material like marble. Marble can be installed as flooring, on walls and as countertops. One cannot deny that the Ancient Greek and Roman architects and sculptors had impeccable taste when it came to selecting a material as beautiful and luxurious as marble. Modern kitchen backsplash with brick tile pattern. 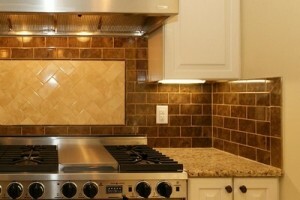 Adding a new backsplash in your kitchen or bathroom is a quick and economical approach to updating the look of the room. There are a variety of materials we can use to create a look that will bring out the personality of the room and reflect the taste of the homeowner. Elegant bathroom remodel with marble shower walls and floor. Tile showers are one of our favorite rooms to work with – there are so many possibilities with the design, the color, the shape and the type of tile we can use. Homeowners can get really creative with the type of material they can use (e.g., ceramic tiles, marble tiles, glass tiles, etc. ), unique layout patterns and border options. There are also creative ways to make your new shower functional with built-in soap & shampoo holders, custom seating options and cool new leg shaving post for the ladies. And, who can deny the experience of stepping out of a hot shower onto a cold tile floor in the middle of winter? There is an amazing technology out in the market right now where a heating grid can be put down prior to laying the tile that will keep the floor at a comfortable, pleasantly warm temperature all year long. These are just a few ideas to consider. The truth of the matter is that you and your family will be using this room every day. We will create a space for you that is enjoyable and durable. Our showers are tiled to last! We are one of the most experienced tile installers in the area of ceramic tile. Ceramic tile is one of the most versatile materials homeowners use in their home. There is so much we can do with ceramic tiles! Tiles can be used for flooring, in showers, in the kitchen, in sunrooms, as accent detail to liven up a living space – the list goes on and on. Ceramic tiles can be laid on floors, walls, ceilings, countertops, stairs, and even on furniture – as long as we have a sound surface to put it on, we can lay it! And, do we need to mention the infinite number of patterns we can lay the ceramic tile? Our tile experts can lay tile in standard patterns or in elaborate, bold, colorful designs that can bring life into any room. Old pine treads replaced with new oak treads and stained a rich Gunstock color. A new trend in home remodeling is replacing old stair treads and risers. Many homeowners are removing their old carpeted stairs and replacing the construction pine with beautiful new oak treads. The new oak boards can be stained any color that you want to either match or compliment the space. Stemmley’s Flooring & Backsplashes will carefully remove your old, worn stair treads (including the carpet), cut new wood to fit on the risers, secure them and stain them in any color that you choose. All staining, painting and urethane is done at our shop. Then the material is brought back to the job site where we ensure the fit is perfect. A set of custom laser engraved tiles that can be laid to personalize your living space. Your backsplash and tile designs can be personalized with custom laser-engraved tiles made out of brick or ceramic material. These tiles are durable and can be used as part of a flooring pattern, a backsplash or even as part of a countertop. The laser engraved tiles are so durable, they’ve passed a series of weather-testing for outdoor use! The patented laser-engraving process produces a dark, lustrous mark on the tile. The unique lasering process allows for a wide variety of fonts, graphics, photo depictions, sketches, children’s artwork, family trees and logos to be imprinted into the tile. Adding a custom imprinted tile to your layout will add the level of personalization that would make any home improvement project more dear to your heart.